Carboxyloids, such as esters, can interconvert with each other in the presence of the appropriate nucleophile. In the case of esters, an equilibrium will result. If an alcohol is added to an ester, under the right conditions we might get a new ester. A new alcohol would also appear, originating from the old OR group of the original ester. Two different esters and two different alcohols would be in equilibrium. This equilibrium might be perturbed in one direction or another, for example, by the addition of an excess of one nucleophile. In the jargon of synthetic organic chemistry, an ester is a functional group. It is a site on the molecule at which reactions take place. It is also a site on the molecule that is easily subject to synthetic transformations. In other words, one functional group might easily be converted into another. In the case of a trans-esterification reaction, one ester simply gets converted into another. Some compounds have more than one functional group. A compound could be both an ester and an alcohol, for instance. We might call this compound a hydroxyester. But wait -- if an alcohol can react with an ester, to make a new ester, doesn't this compound have both components of a reaction built in? Could it react with itself? There are a couple of ways that could happen. If the chain between the carbonyl and the hydroxyl group is long enough (remember, a six-atom interaction between the hydroxyl oxygen and the carbonyl carbon may be optimal), the hydroxyl could wrap around and form a cyclic ester. That's an intramolecular reaction -- a reaction within one molecule. Alternatively, if there is another one of these molecules around someplace, an intermolecular reaction might occur. That's a reaction between two different molecules. The hydroxyl group on one molecule can reach out and react with the carbonyl on another molecule. Now there are two molecules of the same kind bonded to each other. This double molecule is called a dimer. The individual molecules that have been linked togethr to make the dimer are called monomers. That dimer has two esters in it, not just one. Of course, it still has a hydroxyl group on one end. That hydroxyl group can still react with another carbonyl on another molecule. Now there are three molecules bonded together. This molecule is called a trimer. This process could keep going on indefinitely, of course. We might end up with a very large molecule, composed of many individual (former) molecules that have bonded together. This very large molecule made up of repeating units is called a polymer. A polymer is built up from many monomers linked together. This particular kind of polymer is called a polyester. This polymer is frequently drawn in a way that emphasizes the repeating pattern of monomers that have been incorporated into the chain. Polyesters can also be made by co-polymerizing two different monomers together. One monomer could be a diester, for example. The other monomer could be a diol. These two molecules are ready to react together, with one molecule acting as an electrophile and the other molecule acting as the nucleophile. Together, the diester and the diol could be polymerized. The result would be an alternating copolymer, in which diester and diol monomer units alternate all along the polymer chain. Polymers make up an important class of materials with many uses. Many polymers are lightweight, strong materials used to make parts for automobiles and other products. Polymers can also be very flexible or elastic. The physical properties of polymers are very different from the properties of other molecular compounds. These differences are a direct result of the very large size of polymer molecules. A polymer molecule might be thousands of monomers long, with a molecular weight in the millions. 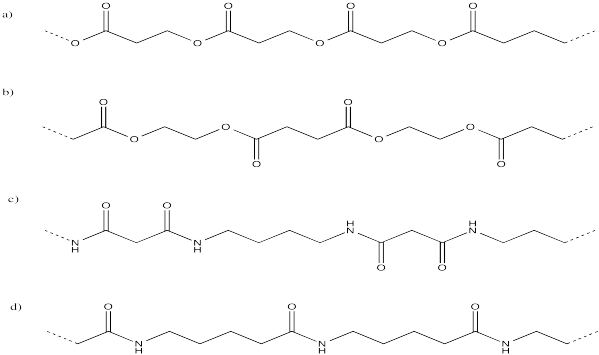 Express the following polymer structures in abbreviated structures showing n repeating units in parentheses. 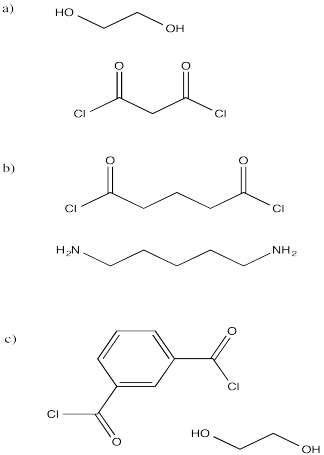 Show the structures of the polymers that would result from the following monomers. In each case, show a drawing with several enchained monomers. Ring-opening polymerization involves a multi-step reaction in which a cyclic compound, such as a lactone (below) is opened into a chain through the addition of a nucleophile (called the "initiator"). 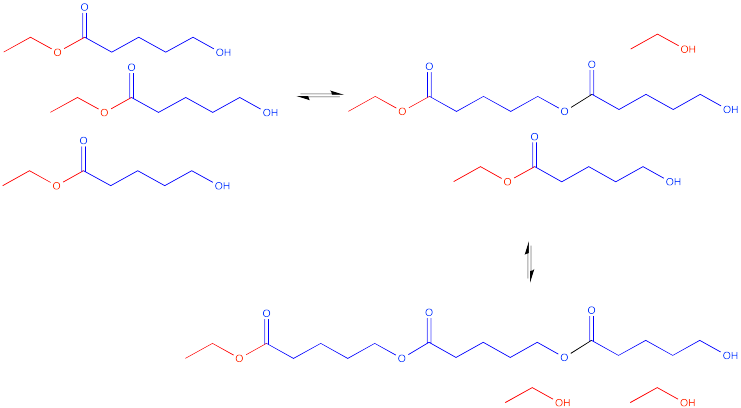 The resulting chain is able to act as a nucleophile and open the next lactone, and so on, until a polymer has formed. Show a mechanism for formation of the oligomer in which n = 3. Ring-opening polymerizations are frequently accelerated through the addition of small amounts of metal compounds, such as diethylzinc (Et2Zn) or tin octoate (Sn(O2CCH(CH2CH3)CH2CH2CH2CH3)2. Explain the role of these compounds in the reaction mechanism. Karen Wooley at Texas A&M recently reported the following synthesis of a polyphosphoramidate for use as a pharmaceutical delivery agent. The goal is to use a benign delivery agent that is easily broken down and excreted by the body, resulting in low toxicity and minimal side effects. a) Provide a mechanism for the synthesis. b) Explain why the polyphosphoramidate is expected to be broken down and excreted easily by the body.